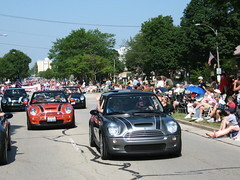 A total of 19 Chicago and Milwaukee area MINIs participated in the Milwaukee MINIs 4th of July parade in Wauwatosa Wisconsin. 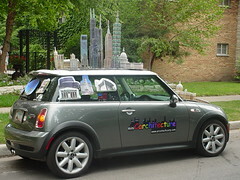 The weather was great, the crowds were enthusiastic, and the MINIs were dressed to the nines.. Thanks to Theresa for planning the event, and letting the Chicago Club come up and hang with the Milwaukee club!! WRAPUP: Thirteen MINIs (including several new members) came out for an early morning drive through some fun back roads. Yellow MINIs dominated on the color count this time. Many of us had our first ever trip to a tatoo parlor. We somehow managed to get through almost every traffic light as a bunch. 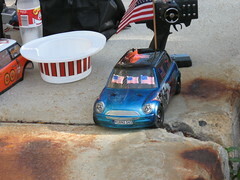 A couple of autocross events have just hit the club forum area.. If you can’t make the Indiana Drive, grab your helmet and have some fun!! MINIUSA will be organizing a Cross Country Drive called MINI Takes the Sates (MTTS) to celebrate the arrival of the JCW Cooper S GP kit. 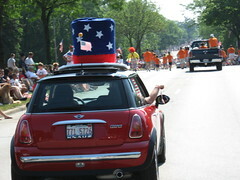 Patrick MINI, in conjunction with Chicago MINI Motoring Club – will be conducting a drive from South Holland Oasis near the Illinois-Indiana border (time TBA) to Indy on August 30th to see off the MTTS procession. Of course, don’t forget our Club events, on Saturday June 24 (details to be announced soon), and the Mad Dogs and Englishman Car show in Kalamazoo Michigan on July 8th and 9th!! 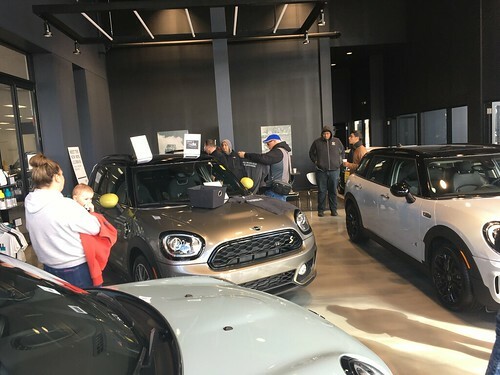 Club member Francis took a roadtrip to Mini-sota to participate in the US version of the London to Brighton run on May 20th.. (the British counterpart was run on May 21st).